off at the Parish House garage at the corner of Penniman & Church on Monday and Thursday evenings from 7-8:30 PM or at Our Lady of Good Counsel Church (Beck and North Territorial) at the PBJ bin which is down at the end of the West Hallway. We have been lucky to have had over 110 prizes donated by some very generous organizations and people. They are valued over $12,000!! 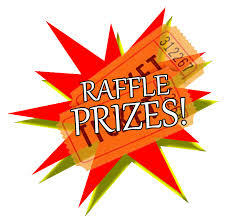 Please come try your luck at our raffle and silent auction and enjoy the all you can eat (Yes! all you can eat) spaghetti dinner. For a complete list of prizes and ticket information click on the Spaghetti Dinner page. Spaghetti Dinner Hotel Prize Packages! PBJ has been lucky to have fantastic Detroit hotels (El Moore, Detroit Foundation Hotel and The Siren) donate overnight stays for our Spaghetti Dinner Fundraiser on Saturday, Sept, 22. We are putting together fantastic prize packages to include donations from other Detroit institutions such as, Mario’s, Jolly Pumpkin, Slow’s BBQ, Motor City Brewing Works, Traffic Jam & Snug, Will Leather Goods, Honest John’s, Old Soul Vintage and More! Get your tickets today. Pizza!! If you like pizza, please stop by the Livonia (Laurel Park Mall) California Pizza Kitc hen on Friday, August 17 from 11am to 10pm. CPK is donating 20% of your bill for a PBJ Blanket drive when you mention the PBJ Outreach Fundraiser. Job One: PBJ is in nee d of some adult volunteer(s) to assist with the Clothing side of the operation. We are in need of men and women who would be able to commit to at least once a month to become a Volunteer Leader on Monday or Thursday evenings from 7-9pm. The Volunteer leader would help in the clothing sorting and folding operation by being there to greet volunteers (typically 4-6), set-up the jobs to be done for the evening, instruct the volunteers on how to perform the tasks, ensure required tasks for the evening are completed, open and close the basement/garage facility. 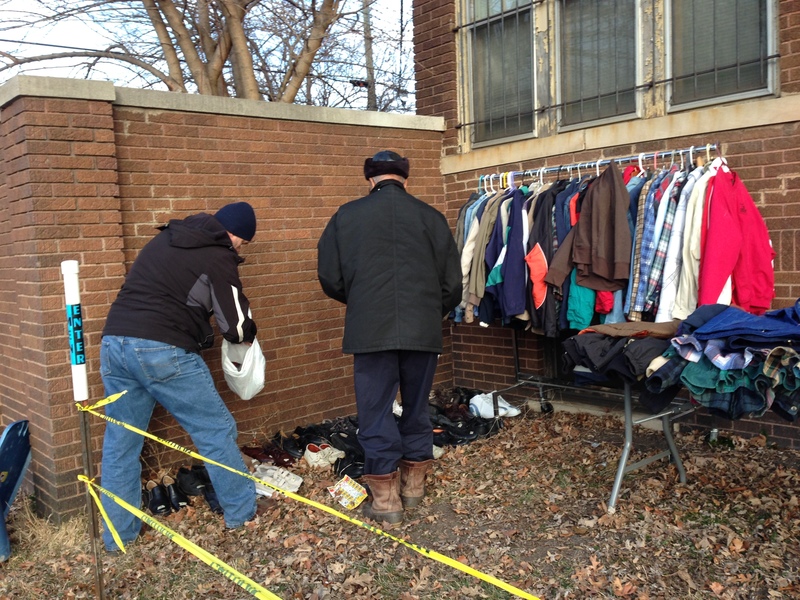 The clothing operation is done in the basement and garage of the OLGC Parish House on Penniman Avenue in downtown Plymouth. You would work along side a seasoned volunteer who would help train you on the various tasks. There is some lifting of donations (bags/boxes). Job Two: PBJ is in need of a back-up volunteer to do a 2-3 time a week pick up of donations from Our Lady of Good Counsel Church in Plymouth and drop off at the PBJ sorting area at the garage of the Parish House on Penniman in downtown Plymouth. The church is located at 47650 N. Territorial in Plymouth. This entails picking up the non-food donations from inside the vestibule of the church and transporting them to the garage, We are estimating this will need to be done 2-3 times a week when other volunteers are unable to do it. If you are interested in helping out or need more information, please fill out our Contact Us Form with your contact information and what job you are interested in and we will get back to you. Save the Date! Annual Spaghetti Dinner Fundraiser is on Saturday, September 22, 2018. Check out all the details and buy your tickets on-line today! The cold weather is now here. If you are looking for donation ideas, please consider hats, gloves, scarves, boots, warm socks and blankets. Especially for men! Thank you. 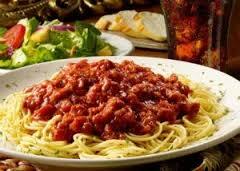 The Spaghetti Dinner Fundraiser is Saturday, October 28, from 5-8pm. Check out the details and the complete list of prizes here, Spaghetti Dinner. Tickets will be available at the door or can be purchased ahead on-line. See you there! They’re Here….. Are you going to be the lucky winner?? You can purchase your tickets for our Annual Spaghetti Dinner Fundraiser on-line, https://pbjoutreach.org/spaghetti-dinner. You don’t want to miss out!! Do you like to dine out? These generous restaurants have donated gift certificates for our upcoming Spaghetti Dinner Fundraiser! If you happen to visit these restaurants, please say thank you! This year the Spaghetti Dinner Fundraiser will be held Saturday, October 28, 2017. And yes, the Disney Tickets will be back!! Visit the Spaghetti Dinner page for more info and to purchase your tickets! Adult Volunteers Needed for Clothing Operation. Job One: PBJ is in need of some adult volunteer(s) to assist with the Clothing side of the operation. We are in need of men and women who would be able to commit to at least once a month to become a Volunteer Leader on Monday or Thursday evenings from 7-9pm. The Volunteer leader would help in the clothing sorting and folding operation by being there to greet volunteers (typically 4-6), set-up the jobs to be done for the evening, instruct the volunteers on how to perform the tasks, ensure required tasks for the evening are completed, open and close the basement/garage facility. 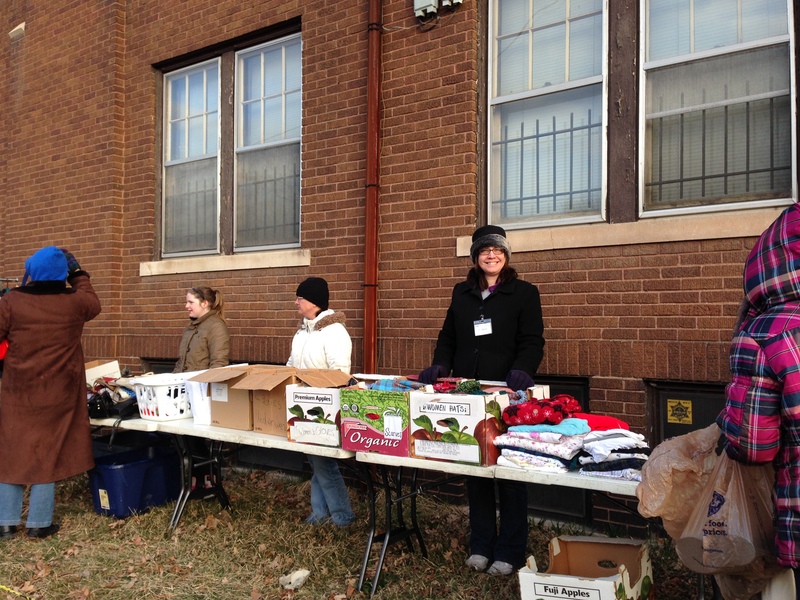 The clothing operation is done in the basement and garage of the OLGC Parish House on Penniman Avenue in downtown Plymouth. You would work along side a seasoned volunteer who would help train you on the various tasks. There is some lifting of donations (bags/boxes). If you are interested in helping out or need more information, please contact Joe Phillips at josephphilipsarchitect@gmail.com with your contact information and he will get back to you. May Need: Baseball Hats! If you are doing some spring cleaning and have extra baseball hats our guests would appreciate your donation. You can drop off at the Parish House garage at Penniman & Church on Monday and Thursday evenings from 7-8:30 PM when we are sorting clothes (see calendar) or at Our Lady of Good Counsel Church at the PBJ bin which is down at the end of the West Hallway. Job One: PBJ is in need of some adult volunteer(s) to assist with the Clothing side of the operation. We are in need of men and women who would be able to commit to at least once a month to become a Volunteer Leader on Monday or Thursday evenings from 7-9pm. The Volunteer leader would help in the clothing sorting and folding operation by being there to greet volunteers (typically 4-6), set-up the jobs to be done for the even…ing, instruct the volunteers on how to perform the tasks, ensure required tasks for the evening are completed, open and close the basement/garage facility. The clothing operation is done in the basement and garage of the OLGC Parish House on Penniman Avenue in downtown Plymouth. You would work along side a seasoned volunteer who would help train you on the various tasks. There is some lifting of donations (bags/boxes). Job Two: PBJ is in need of a volunteer(s) to do a 2-3 time a week pick up of donations from Our Lady of Good Counsel Church in Plymouth and drop off at the PBJ sorting area at the garage of the Parish House on Penniman in downtown Plymouth. The church is located at 47650 N. Territorial in Plymouth. This entails picking up the non-food donations from inside the vestibule of the church and transporting them to the garage, We are estimating this will need to be done 2-3 times a week to keep the area in the church from becoming crowded with donations. It could be done by one person or a few could rotate. If you are looking to do a community service project or have extras in your closet, we are in need of men’s scarves and shoes. You can drop off at the Parish House garage at Penniman & Church on Monday and Thursday evenings from 7-8:30 PM when we are sorting clothes (see calendar) or at Our Lady of Good Counsel Church at the PBJ bin which is down at the end of the West Hallway. As we move into the cooler temperatures, we are extremely low on these items for men. If you are cleaning out your closets, can you please bring your extras to PBJ? You can drop off at the Parish House garage at Penniman & Church on Monday and Thursday evenings from 7-8:30 PM when we are sorting clothes (see calendar) or at Our Lady of Good Counsel Church at the PBJ bin which is down at the end of the West Hallway. We would like to thank all of those who supported our Fundraiser this year. We had a wonderful turnout and could not have done it without all the volunteers who helped to make this such a fantastic night. Appreciation also goes to all the businesses and individuals who donated to our raffle and silent auction. We were fortunate to have over $8,000 in prizes donated to PBJ. If you were lucky enough to win one of the prizes or happen to visit one of the businesses listed on the Spaghetti Dinner page, please tell them thank you on behalf of PBJ! A special thank you goes out to Gordon Food Service and Absopure Water for donating the ingredients, supplies and water to make this dinner a success. Are you a Sports Fan! Tickets are Still Available for the Spaghetti Dinner Fundraiser this Saturday, October 15! There are plenty of Raffle Items for the Sports Fan! You can buy your tickets on-line https://pbjoutreach.org/spaghetti-dinner/ or the night of the dinner. Wouldn’t you love a chance to win something from these great donors? Any Golfers in the Crowd? Spaghetti Dinner & Raffle Fundraiser Tickets are now available to purchase on-line! Visit our website and purchase yours today. Look at all the great Northville businesses who have contributed to our raffle. You won’t want to miss your chance to win, October 15th could be your lucky day. How would you like to meet Minnie and Mickey in person? Join us October 15th for the PBJ Spaghetti Dinner and Raffle Fundraiser. 4 Disney tickets (valued at $620) are up for grabs in the Silent Auction! Hope to See you Soon. Good Luck! Friends and Fun in Mexicantown! We were fortunate to have the Meads Mill Middle School Girl Scouts back to help. A birthday celebration for Janelle and Miguel! Friends Katherine, Serena and Brianna get to spend some time together……always something to celebrate and make you smile! Thank you for supporting the BBQ Drive-thru Lunch Fundraiser. It was a great success and are thankful the rain held off! We are also thankful for Bernie and his crew of volunteers, the team at Michigan Custom ‘Que and all those who stopped by and picked up a lunch. BBQ Lunch Fundraiser Tickets are Available! Like us on Facebook! Keep up with the latest happenings of P.B.J. Outreach. Click on the Facebook image below and then hit Like. Save the Date – Annu al BBQ Lunch Fundraiser. This year the date is Saturday, Aug 20. Tickets will be available shortly. The great cooks at Michigan Custom ‘Que will be back volunteering their services! We recently sent out email invitations to our First Annual Volunteer Appreciation Potluck. The emails went to volunteers we had an email address for through Punchbowl (an online invitation company). If you did not receive an email and would like to receive an invitation to the event, please visit the Contact Us page on our website and choose Appreciation Potluck from the drop down. We hope to see you there! May Request – Sneakers, Tennis Shoes, Gym Shoes, Kicks, Trainers, etc. Now that the season has changed and we no longer need boots (yeah! 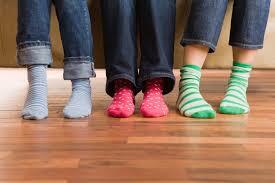 ), our guests are in need of shoes for the warmer weather. If you are doing some spring cleaning and happen to run into some extras around your house, would you please consider donating them to PBJ. We are especially in need of men’s. You may drop them off at the west entry of Our Lady of Good Counsel Church. The drive to the entrance is just past the church on the right behind the garage. The church is located at 47650 N Territorial Rd, Plymouth, MI. Please label the donation PBJ and drop it in the PBJ labeled box, which is right inside the door. If you are volunteering with us, you can also bring the items the morning or night you volunteer. As always, we thank you and our guests thank you! It is with much sorrow that we celebrate the retirement of a long time PBJ Outreach volunteer. 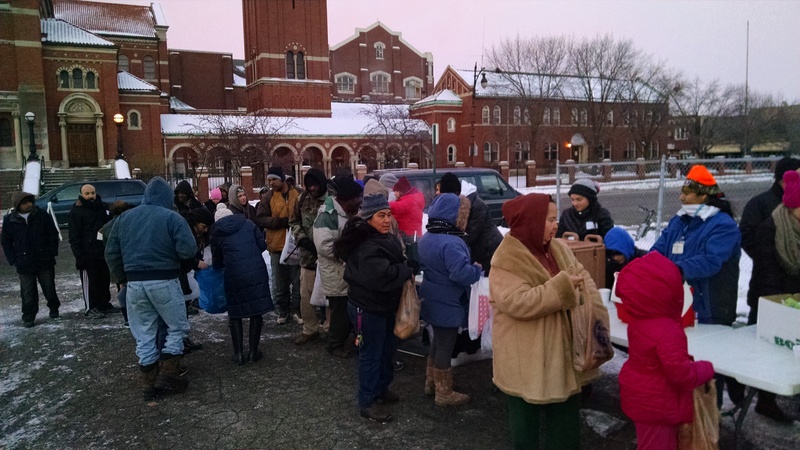 Since 2003, “Van” has been volunteering with PBJ and helping us bring clothing to those who visit us at Martin Luther King Jr. Blvd in Detroit. We have estimated that “Van” has delivered clothing about 260 times and carried approximately 6,240 boxes of clothing to Detroit. This is quite an accomplishment for someone who is only 14 years old. We were hopeful that retirement could wait a few more years, but nonetheless, the wear and tear of 179,277 miles has taken its toll. Sway bars, brakes, power steering, struts, shocks and a corroded undercarriage has proven too much to endure. So as “Van” drives off into the sunset we say goodbye and thank you for your may years of service. Pictured with “Van” are long time friends that know it has not been easy being green. If you or anyone you know is in possession of a vehicle in good running order that would be willing to donate it to PBJ Outreach, please contact Joe Philips at (734) 748-3613. A Thank You to Pass on to All of You – Happy Valentines Day! We received this from one of guests in Mexicantown. If you ever wonder if people appreciate the goods you donate or if the money you donate helps someone have a better day, please read this note and you will know it is all truly appreciated. Santa is on his way thanks to the Dryja family and their band of elves! Kathy Dryja and her family have been helping PBJ and those we serve for 9 years. She started back then making 5 boxes and this year more than 100 people came to her house to put together 1065 boxes! It is a year long process of collecting empty shoe boxes and the goodies that go inside. Each box is packed with hygiene necessities as well as socks, hats, scarves and gloves. There is even a signed holiday card tucked inside each box which is then wrapped in festive holiday wrap. 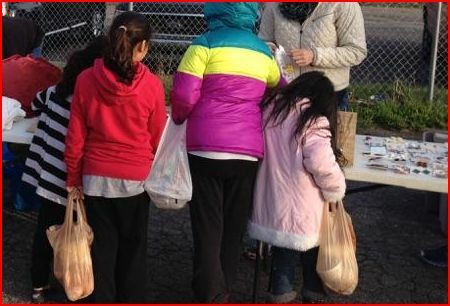 They are then transported all around the Detroit area and distributed to groups in need just in time for Christmas. PBJ is a very lucky recipient! Channel 7 even heard about this great family and posted a story online, http://www.wxyz.com/news/wrapped-shoeboxes-to-help-needy. Thank you Dryja family! We received a very generous donation from Plum Market thanks to a phone call from one of the PBJ volunteers, Paria Payrovi. We were able to pick up cases of healthy, organic food from the NEW Ann Arbor store on Plymouth Rd. this week. We welcome Plum Market to the PBJ family. 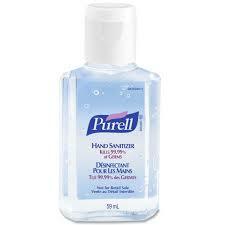 It is that Time of Year – Winter Needs! You may bring through through the west entry of Our Lady of Good Counsel Church. The drive to the entrance is just past the church on the right behind the garage. The church is located at 47650 N Territorial Rd, Plymouth, MI. Please label the donation PBJ and drop it in the PBJ labeled box, which is right inside the door. If you are volunteering with us, you can also bring the items the morning or night you volunteer. As always, we thank you and our guests thank you! A group called the “Giving Tree” out of Walled Lake Central High School held a “Socktober” event collecting socks for those in need. The goal was 1,000 pair, but this group of 25 high school students collected 3,018 pairs of socks in a couple weeks!! PBJ is the very grateful recipient of 2,666 pairs of socks. This is a tremendous donation to PBJ!! Thank you! Thank you to all who attended and supported the annual fundraiser last Saturday night. We also want to thank Carl and Mary Short for leading the charge and to all volunteers and business sponsors who made this all possible. We had over $8,000 in raffle prizes donated, we had some lucky winners! Girl Scout Troop 40020 from Meads Mill Middle School joined us in Mexicantown! You did a great job and your enthusiasm was contagious – thank you! Need to get rid of a Bike?? One of our volunteers Joe Kott has come up with the idea to provide bikes to our guests downtown. 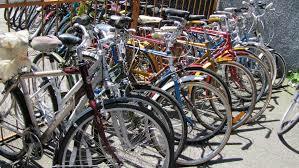 If you have an adult bike (that is in working condition) you would like to donate to PBJ, please contact Joe. He can be reached between 8 a.m. – 8 p.m. at (734) 341-7106. He is willing to pick up the bikes, within a 40 mile radius of Plymouth, if need be. Thanks Joe! Spaghetti Dinne r Raffle Prizes Needed! The annual PBJ Spaghetti Dinner fundraiser is in the planning stages. We are seeking prizes for the fantastic raffle that takes place at the dinner. Do you have new gift cards laying around that you have never gotten around to using? Do you own a business or work for one that would be willing do donate their services, gift certificate, a gift basket or cash? If so, please send an email to cmkelley2@hotmail.com. We have until October 15th to collect the prizes. Thank you so much for helping! Second annual Drive-thru Hot & Ready BBQ Lunch Fundraiser will be held Saturday, August 22 from 11am to 2pm. 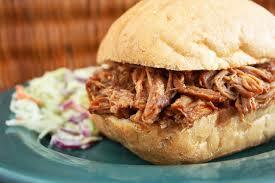 Lunch includes: BBQ Pulled Pork Sandwich, Cole Slaw, Potato Salad and a Bottle of Water! Tickets are now available. Get yours now before they sell out! In Person – The Danish Clipper located at 1380 S. Main St., Plymouth, MI 48170 734-453-3940. 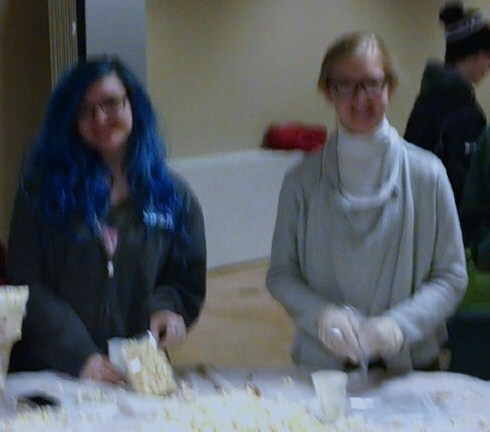 Saturday mornings at Our Lady of Good Counsel Church from 6am to 7:15am during PBJ food prep. The annual PBJ Spaghetti Dinner fundraiser is in the planning stages. We are seeking prizes for the fantastic raffle that takes place at the dinner. Do you have new gift cards laying around that you have never gotten around to using? Do you own a business or work for one that would be willing do donate their services, gift certificate, a gift basket or cash? If so, please fill out the Contact Us form on pbjoutreach.org and pick the Donate Spaghetti Dinner Prize option. We have until October 15th to collect the prizes. Thank you so much for helping! PBJ’s two annual fundraisers are coming up, so mark your calendars so you don’t miss out on all the fun! Go Teens! Two Creative and Generous Groups. Thank you to Notre Dame Preparatory and Tecumseh High Schools for their fundraising efforts. 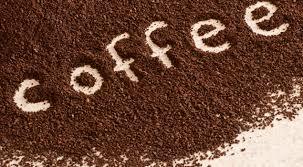 We serve regular, ground coffee every Saturday morning at our two downtown locations. We are currently low in our stock and the donations of coffee have significantly tapered off. If you are looking for a way to support PBJ, could you please donate regular, ground coffee? You may bring it through the west entry of Our Lady of Good Counsel Church. The drive to the entrance is just past the church on the right behind the garage. The church is located at 47650 N Territorial Rd, Plymouth, MI. Please label the donation PBJ and drop it in the PBJ labeled box, which is right inside the door. If you are volunteering with us, you can also bring the coffee the morning or night you volunteer. As always, we thank you and our guests thank you! 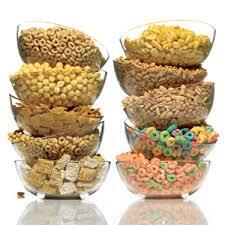 If you are able to donate breakfast cereal, our guests would greatly appreciate it. You may bring it through the west entry of O ur Lady of Good Counsel Church. The drive to the entrance is just past the church on the right behind the garage. The church is located at 47650 N Territorial Rd, Plymouth, MI. Please label the donation PBJ and drop it in the PBJ labeled box, which is right inside the door. 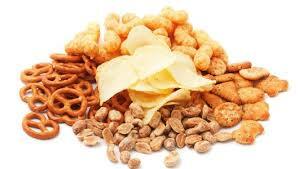 If you are volunteering with us, you can also bring the cereal the day or night you volunteer. As always, we thank you and our guests thank you! Mother’s Day Jewelry Event at Martin Luther King! We held our annual Mother’s Day event for our friends at MLK and Third on Saturday, May 10. 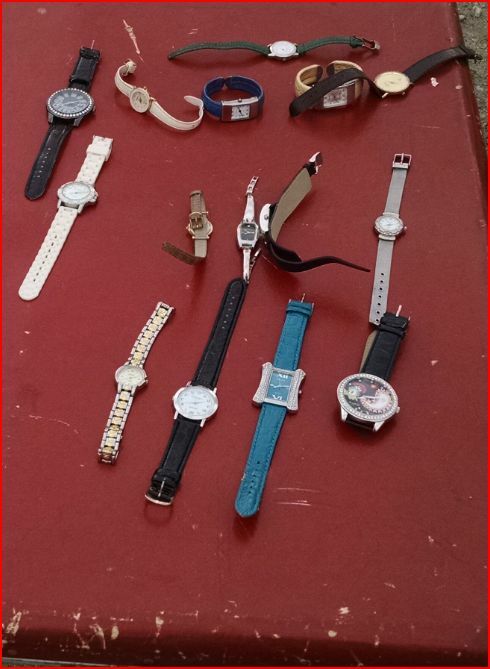 Lots to choose from and thanks to Dana Atkins who spent a few days putting new batteries in about 50 watches that were not working, so we could provide something extra this year! Mother’s Day Jewelry Event in Mexicantown! This is the first year we expanded our annual Jewelry Day to Mexicantown and it was fun watching the young ones pick out presents for their moms. Next Saturday our MLK visitors will be “shopping”. April Request – Canned Fruit & Children’s Underwear and Socks. If you would like to donate canned fruit or children’s underwear/socks please bring them in through the west entry of Our Lady of Good Counsel Church. The drive to the entrance is just past the church on the right behind the garage. The church is located at 47650 N Territorial Rd, Plymouth, MI. Please label the donation PBJ and drop it in the PBJ labeled box, which is right inside the door. 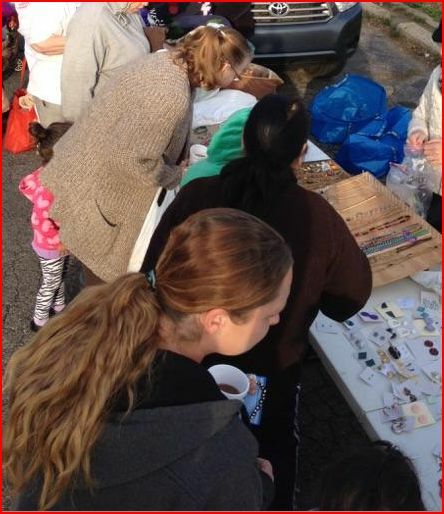 If you are volunteering with us, you can also bring the items the day or night you volunteer. As always, we thank you and our guests thank you! 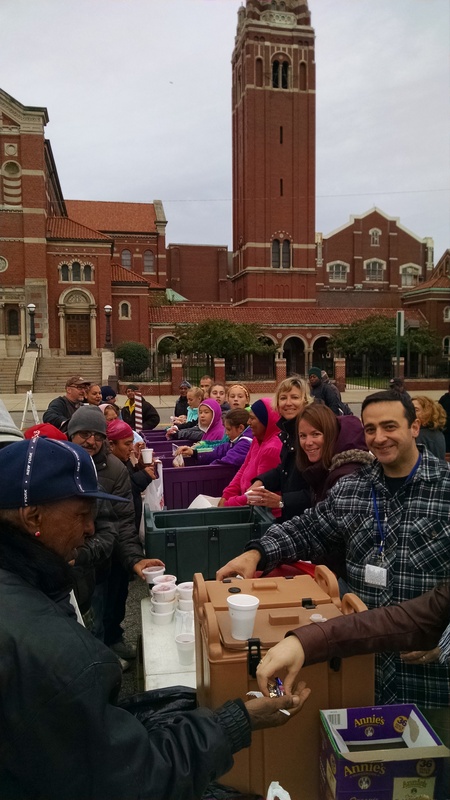 Our friends from St. Thomas Chaldean Catholic Church came to Mexicantown yesterday and brought Easter baskets! St Thomas is a very generous supporter and long-time partner of PBJ. 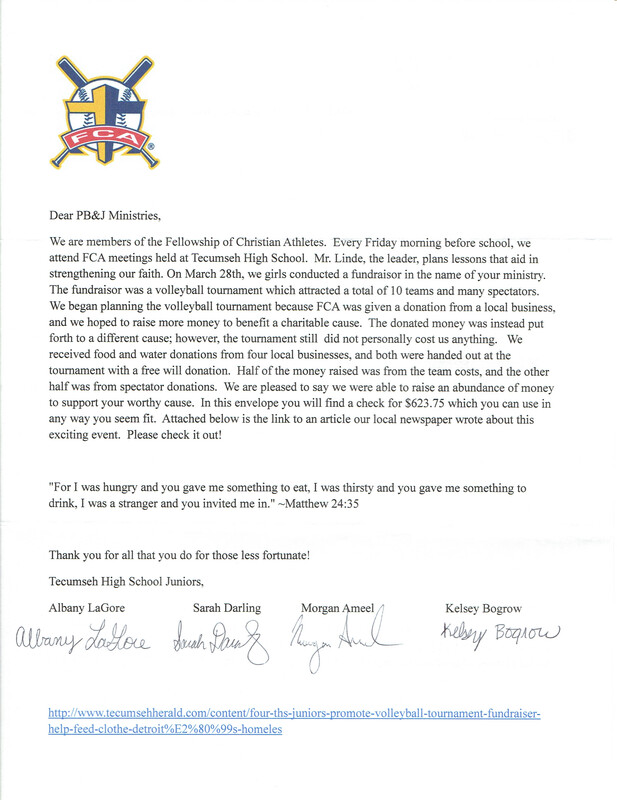 Thank you to those at St.Thomas who made this happen! A New Location for Clothes Distribution! 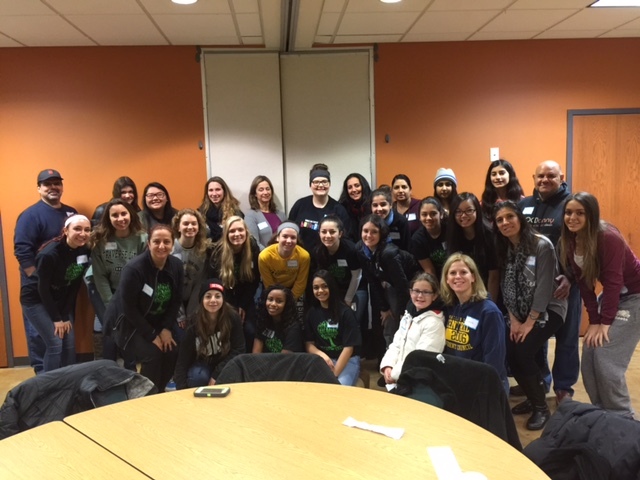 This past Saturday our band of PBJ volunteers expanded our outreach and took clothes to Core City Neighborhoods to distribute for the first time. This will be a new location (about 1 1/2 miles from the MLK and 3rd location) in Detroit. Our volunteers also helped Lillian from Core City Neighborhoods with some of her projects. Volleyball Tournament Fundraiser for PBJ Saturday, March 28th. Look what some great high school volunteers put together! 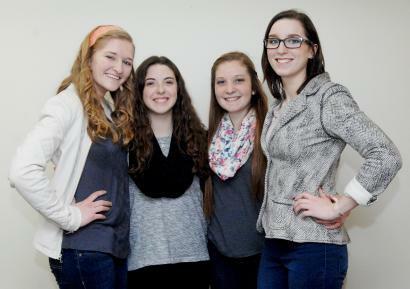 Morgan Ameel (l-r), Kelsey Bogrow, Albany LaGore and Sarah Darling have scheduled a volleyball fundraiser for the homeless at Tecumseh High School for Saturday, March 28. Photo by Mickey Alvarado. 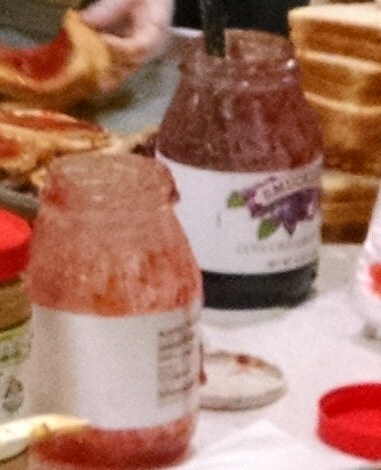 Our jelly jars are getting empty, uh oh! We are not quite PB&J with out our “J”. If you would like to donate jelly or any other pantry items (canned vegetables, soup, fruit pasta, rice, etc.) please bring it in through the west entry of Our Lady of Good Counsel Church. The drive to the entrance is just past the church on the right behind the garage. The church is located at 47650 N Territorial Rd, Plymouth, MI. Please label the donation PBJ and drop it in the PBJ labeled box, which is right inside the door. If you are volunteering with us, you can also bring the items the day or night you volunteer. As always, we thank you and our guests thank you! PBJ and our very own Mark Moening in the news! PBJ was mentioned in an article in the March 5th Observer paper and Mark Moening from PBJ was interviewed. Check it out! Win a Ford Truck and Help PBJ Win $25,000! Ford Motor Company is sponsoring a Good Works campaign. The campaign recognizes those doing good works in their community and we know the PBJ volunteers do ‘great work’! You can enter here, http://fordvehicles.emipowered.net/goodworks2015. Our official organization name is P.B.J. Outreach, Inc. Please read the rules before you enter. Thank you! This Is How We Do It………Ever wonder what goes on during a Saturday morning prep session? Check it out! If you would like to participate, please visit the Volunteer page. Are Our Guests Cute or What? 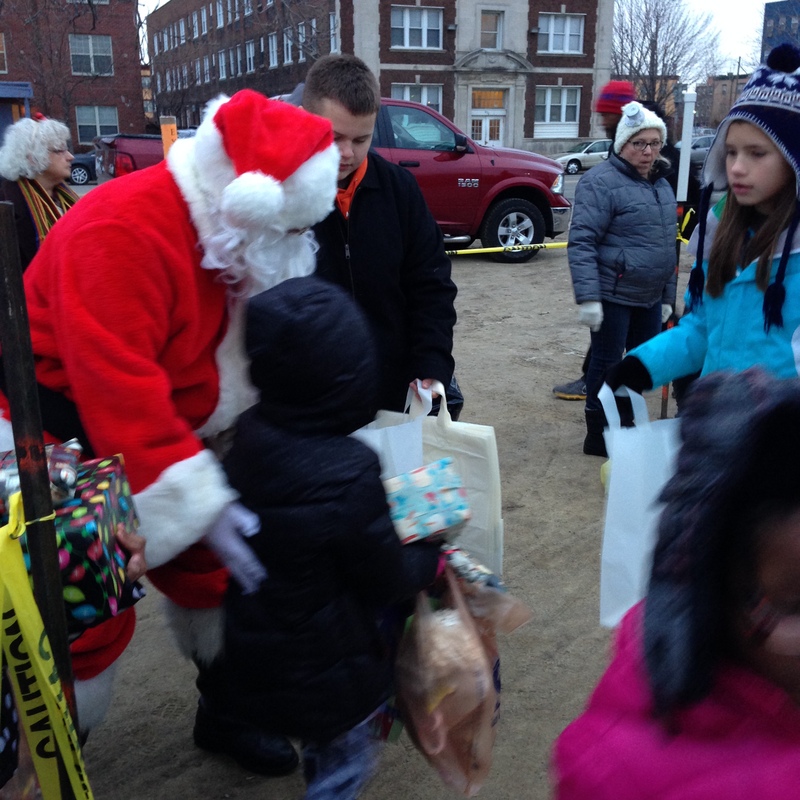 Check out the pictures from today’s activities in Mexicantown. If you are curious where PBJ sets up, it is right across the street from the beautiful Most Holy Redeemer Church. A Great Morning in Mexicantown! PBJ had a great turnout on Saturday morning. 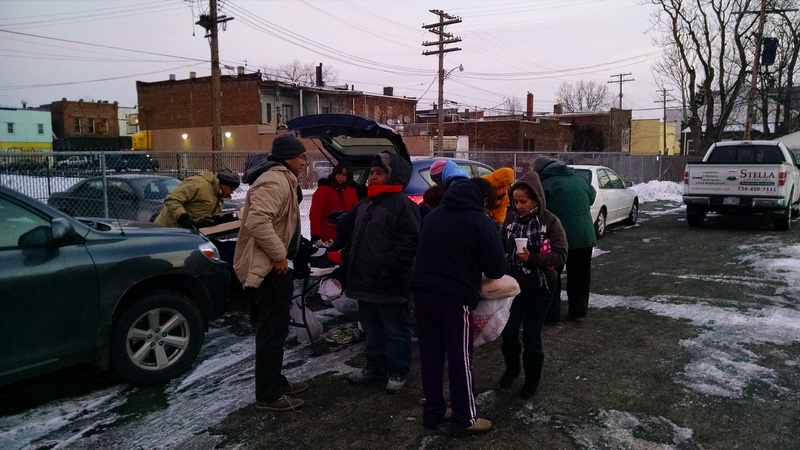 We were able to pass out PBJ, tuna fish and meat sandwiches. The macaroni & cheese with ham was very popular – who wouldn’t like that! 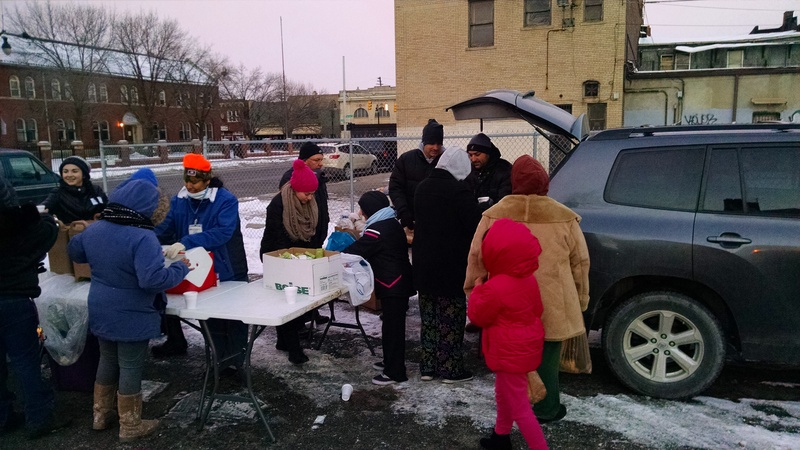 The ever popular tamales were served, as well as some of the families were able to take home some canned foods and other groceries to help them get through the week feeding their families. The team also distributed clothing for adults and children. Take a look at some of the pictures of our friends in Mexicantown. If your workplace is involved in a United Way workplace campaign, please consider designating P.B.J. Outreach, Inc. as a recipient. The PBJ United Way number is 86-1096943. Thank you. PBJ Mentioned in USA Today! One of our great volunteers was featured in the college edition of USA Today. Thanks for mentioning PBJ Josh York! Thank You Catholic Vantage Financial! We were doing our usual on a Thursday night, processing clothing donations and loading the vans for distribution, when we had two visitors join us in the basement. Peter Bagazinski and Emma Teller of Catholic Vantage Financial stopped by to deliver some wonderful donations they collected on our behalf. PBJ would like to extend a big thank you to Catholic Vantage Financial employees and their members for the generous donations to PBJ. 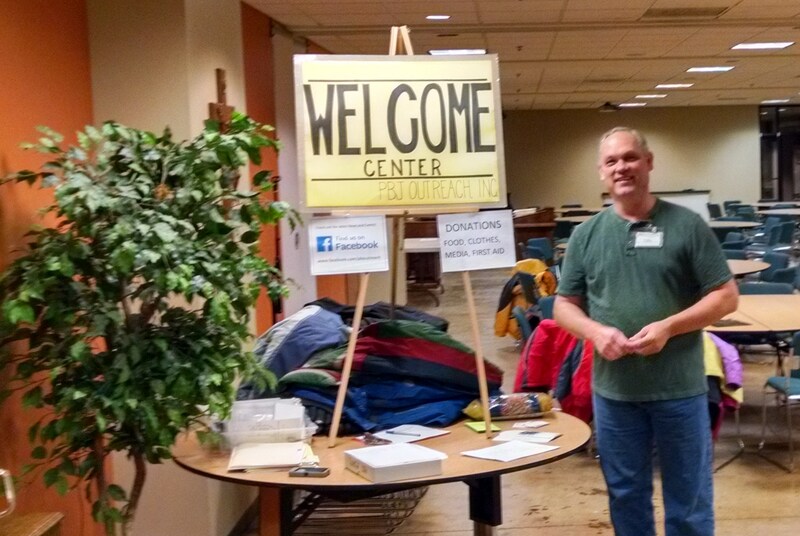 They held a coat and boot drive for PBJ which generated some great donations for those we service. The Catholic Vantage Financial employees also participated in Jean Day on Fridays paying $1 each week they wore jeans to work. 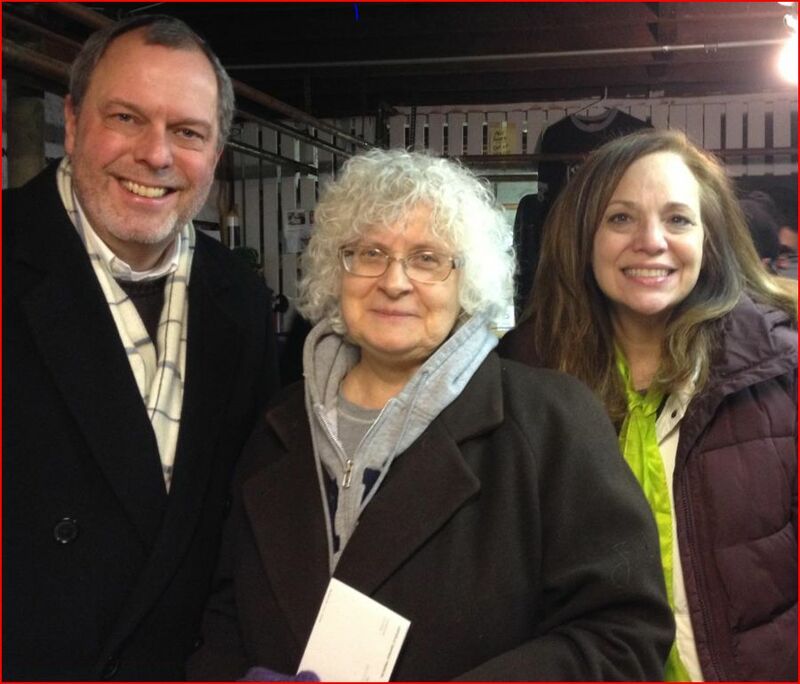 On top of the generous clothing donations, Celeste Wojcik of PBJ (middle) was presented with a check for $150 by Peter and Emma. PBJ Facebook Page – Like Us on Facebook and keep up to date on all the PBJ happenings! Even Santa Volunteers at PBJ! 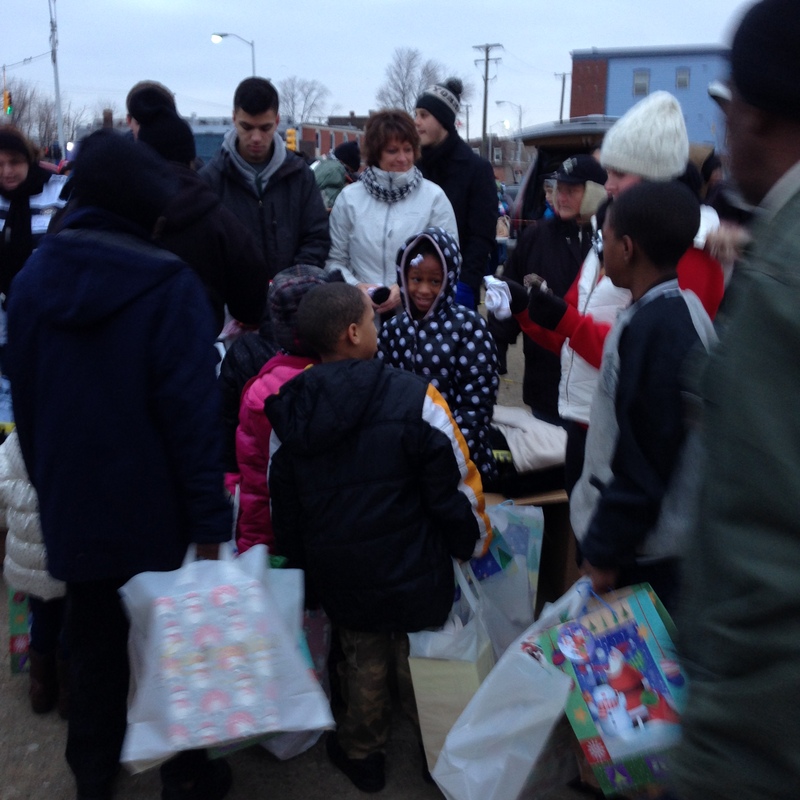 – The annual Christmas shoebox distribution was held on the Saturday before Christmas. Santa and his volunteers passed out beautifully wrapped shoe boxes filled with gloves, socks, hygiene items and candy to our friend’s downtown. The shoe box program was spearheaded by one family and their friends resulting in approximately 1200 boxes delivered to PBJ! That was enough for PBJ as well as a few other charities PBJ partners with when blessed with extras. It is truly amazing what PBJ supporters can do! Christmas Posada Celebration – PBJ was honored to host a Posada Event for approximately 125 children who are parishioners of The Most Holy Redeemer Church in Mexicantown. 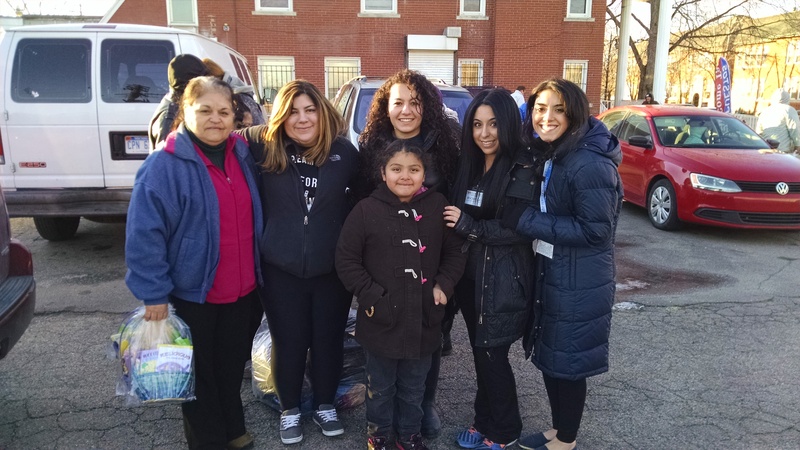 Mexicantown is one of the neighborhoods PBJ services and were thrilled to be able to celebrate with these families and provide gifts for the children. If you would like to volunteer in the future and help with our ongoing service to the Mexicantown neighborhood, please visit the Volunteer page for more info. 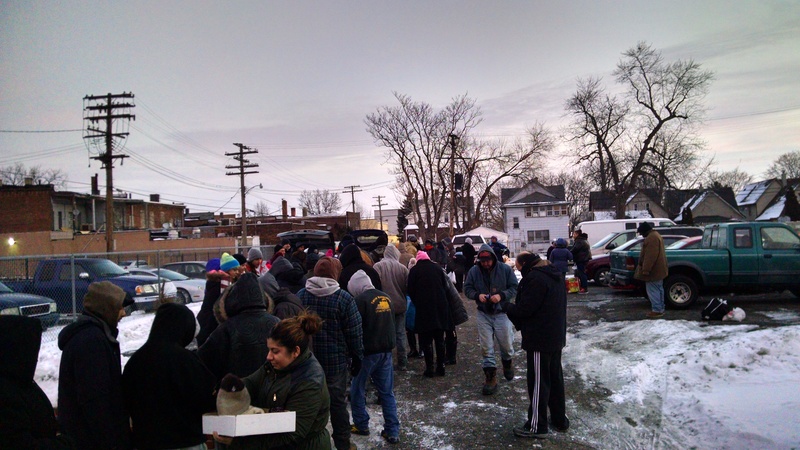 Lawyers Serving on the Front Line for PBJ – Dozens of Michigan lawyers and judges, have spent their Saturday mornings making sandwiches; passing out food, clothing, and books; and providing much-needed fellowship to the poorest of the poor in Detroit’s infamous Cass Corridor. Read more about this beneficial partnership.